The Nintendo Switch is back again with another huge title after a year full of amazing games such as The Legend Of Zelda: Breath Of The Wild, Splatoon 2, and Mario Kart 8 Deluxe. Super Mario Odyssey has been one of the most anticipated games of 2017 since it was announced at the start of this year when Nintendo officially revealed the Nintendo Switch. The one question on everyone’s mind is if Super Mario Odyssey lives up to hype and anticipation. The answer to that question is yes, and not only that, it might be the best release on the Nintendo Switch so far. In Super Mario Odyssey you are tasked with saving Peach from Bowser (Of course!) and you will do this with a new companion called Cappy who is also a major gameplay mechanism in Super Mario Odyssey. Mario must use the airship called Odyssey to go through Kingdoms in order to find Peach. The Odyssey will need power to get from kingdom to kingdom, so you will have to find a certain number of power moons to make that possible. Finding power moons is the main objective each time you enter a new kingdom, and as you can imagine, you are going to have to pretty much earn most power moons that you are trying to find. That’s except when you can buy one power moon from the store in each kingdom (Also includes other items such as Mario clothing) Power moons are usually tied to some kind of puzzle that you have to solve, for example a power moon might be really high up so you’ll have to find a way of getting to that high area to obtain the power moon. As I said, every kingdom’s task is finding power moons so as you can imagine there’s definitely a feeling of repetition there, but that feeling isn’t too strong due to the finding methods always feeling different and incorporating different gameplay methods each time. As mentioned earlier Cappy is not only a character and companion for Mario, but Cappy is also a major mechanism in gameplay for Super Mario Odyssey. Cappy can be used to take control of almost any enemy or even friendly NPC, and is used as a way to open different gameplay mechanics to the player. For example you can take over an enemy who is literally a tank, and now you can use the tank and can now fire at other enemies or obstacles that are hiding power moons or are blocking the path to a power moon. I have to say that Cappy is a great mechanic in the game, and constantly makes Super Mario Odyssey feel fresh with different gameplay elements when taking over other characters. Super Mario Odyssey incorporates a lot of boss battles within levels that are well designed, interesting and also have just the right amount of difficulty that it isn’t going to be hair pulling difficult but it’s going to keep you guessing and might take a few tries. Boss battles stick to the old system of three hits and you’ve won, and also includes a lot of situations with Cappy being needed. At times I kind of felt like the boss battles did depend to much on the system of using Cappy, and now I understand that it’s a major mechanic in the game, it would’ve been a personal preference of mine to not have boss battles always dependant on Cappy to change up boss battles. Overall however, I was impressed with the boss battles, and felt like the developers did something really well with the boss design and challenge. One of the biggest positives that I always had on my mind while playing the game was that the level design in Super Mario Odyssey is incredible, and might be some of the best level design I have ever seen in a video game before. Each world feels unique and impressively different to each other, and it also helps that these levels look stunning and must be pushing what the Nintendo Switch can do in terms of visuals to the absolute maximum. I was also extremely impressed with Super Mario Odyssey whilst in handheld mode which I had extensively tested due to how many people play the Switch in handheld mode. I can confirm that from my many hours with the game, everything held up amazingly well in handheld mode. I can’t even say that I had any issues at all with the game whilst in handheld mode, and I can also say that the transition from docked to handheld was almost perfect. There was no noticeable downgrades or feeling that I had to put it back into docked mode because it ran bad or didn’t look as good. I think many people will be very happy with how well the game runs as a handheld. 2017’s Game Of The Year just got a new contender, Super Mario Odyssey IS exactly what I wanted and then some. The hype usually can not keep up with a video game but Super Mario Odyssey not only keeps up with the hype, it has passed it, and has gone way beyond my expectations. Sure there’s some minor issues that I had with the game, but it never once made the game any worse for me. 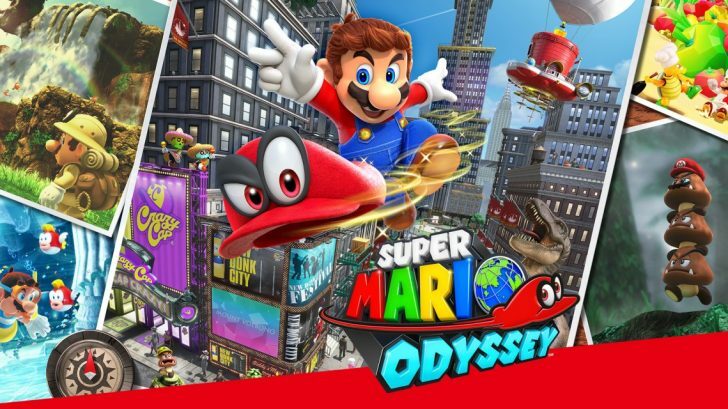 I couldn’t put down Super Mario Odyssey and I’m kind of sad that I have to write this review right now because I want to get back to the world of Super Mario Odyssey that much! Look out other GOTY contenders, it looks like Mario has just entered the game.